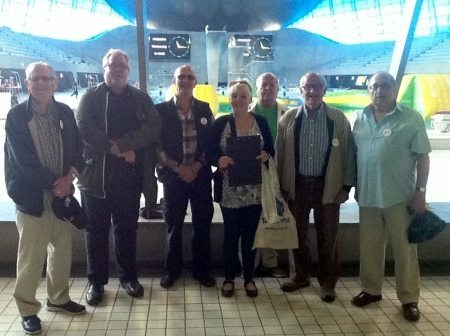 Geezer’s member Barrie Stradling writes his report of The Geezers Club Trip to The Queen Elizabeth Olympic Park. Originally there were due to be more of us going however unfortunately some could not go due to illness or Appointments, in the end 9 of us went myself, John Day and his wife Mavis, Ray Gipson, Pat Murray, Ted Deathridge, John Bevan, John McLaughlin and Ricky Ayliffe. The 9 of us left our Bow base in Parnell Road at 10am and caught a 339 bus from Usher Road to meet up with the company who were taking us on a tour of The Queen Elizabeth Olympic Par. We arrived at the stop in Carpenters Road behind the Aquatic Centre. We arrived in good time and met up with Jenny Phillips from City Steps Guided Tours, website for reference is www.londoncitysteps.com . 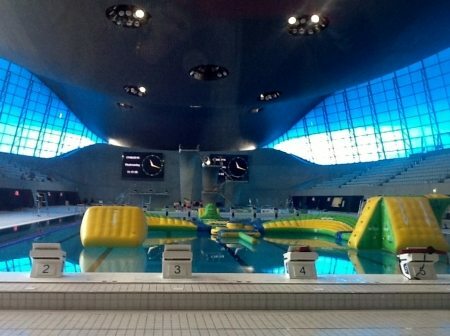 The Tour Guide took us inside the Aquatic Centre where Ray Gipson had been a Games Maker during the 2012 Olympics. As we were early Jenny bought us teas and coffees, and we started our day in the Cafeteria at the Aquatic Centre. 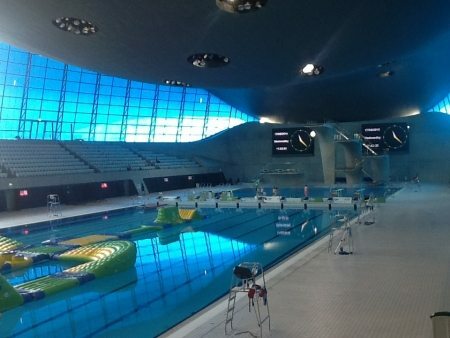 We headed inside the Aquatic Centre which has been adapted so that people can have swimming lessons in the training pools, and could go on to the installed games on the Olympic Pool itself. The Centre has been revamped enormously since the Olympics that Ray volunteered at, and the Paralympics that I had attended, where I saw the Heats of the Swimming with the Headway East London charity who I volunteer for. They have taken away the ends of the arena, massively reducing the capacity from the 17,000 that it was for the Olympics and Paralympics. 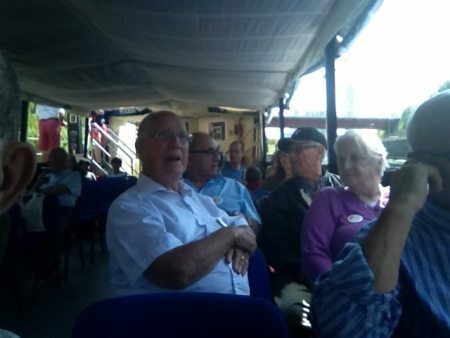 We then headed outside to once again meet our Tour Guide as we needed to get to our barge for our trip around the River Lea. Our trip on the river left at noon with the company that had several vehicles there for these trips, Lee & Stort Boat Co Ltd, their website is www.leeandstortboats.co.uk. We boarded the open-side boat and took up places on the seats in two rows of two, along with additional people who were also on the tour, and were given a run-through of the safety procedures on board, like exits and lifesaving equipment, plus where the toilet was. As we had children on board, they were told not to stand on the seats as they might fall or if they did, their parents/ guardians were told to hold on to them tightly. The first person who did the safety run-through then handed out Lollipops to the over 65s and to the children. Once this procedure, like you receive on air flights was over, we set off on our trip through the park area and alongside the Orbit and The Stadium that is now adorned as West Ham United’s ground. It was a guided tour, with a running commentary on all the wildlife and the flora and trees that lined the banks we were passing. There were also large monument-like objects referred to as Crayons as they resembled huge coloured crayons. We were told that these objects were installed for mooring purposes and where made of the same material as Buoys were. 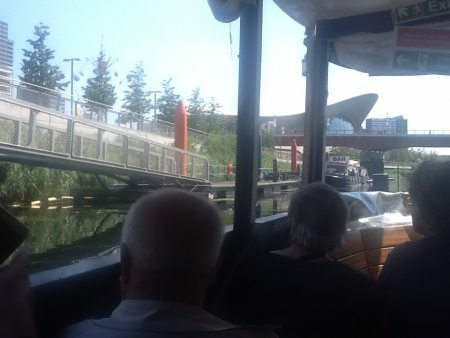 The tour guide did his running commentary on a microphone through an amp at the front on the Barge/ Boat. He informed us how the River was constructed, as it was not just a naturally grown river. 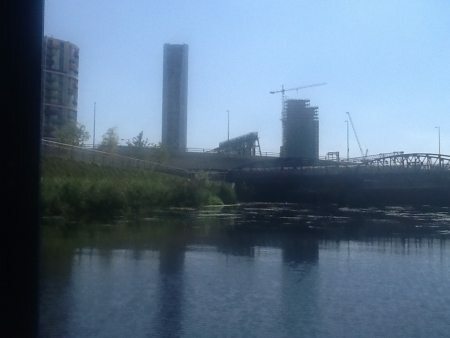 They had drained the River totally pre- Olympic Games and extracted all manner of pollutants and everything imaginable. He said that due to the period of hot weather and lack of rain the river was fairly low, and joked that if we stopped he might ask us to get out and push! Once we reached the road that crossed onto the A12 he explained that the Park fell under the auspice of four Boroughs. The boat then made a U Turn and headed back to the Aquatic Centre, in fact to outside a Beach/Fair area that he said was opened every year, although this year would be the last, he assumed due to work being carried out in the Park with the vast amount of housing for sale or rent in the area that had housed the Olympic and Paralympic 20,000 plus athletes. On our outward and return journey he informed us of the construction of the bridges, the renovation of a radical lock system, how the structures that lined the lock was all recycled material from the construction work that had taken place in constructing the Olympic Park, which he said was one of the Largest in London, akin to Hyde Park and the first park to be erected in the Capital for many decades or more. 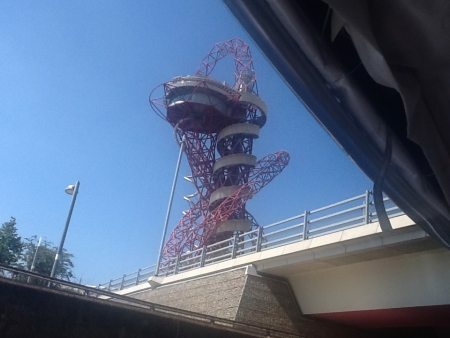 He explained the Olympic Symbols that festooned part of the route, how the Orbit had been built and how the Olympic Stadium was now West Ham United’s on a 90-year Lease with minimal rent. 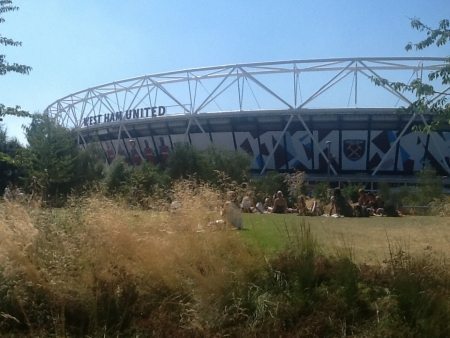 In reality, he also explained that many other sporting Events would also be taking place in the Olympic Stadium during West Ham United’s tenancy like Athletic events. AC/DC had appeared in the stadium June 4th 2016 – it was the first Rock event to have happened there. He told us of the change in capacity for the Football club and how the roof and floodlights had been adapted. 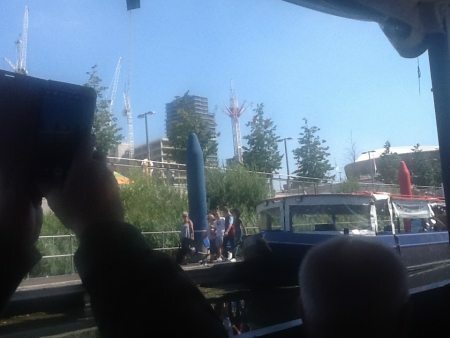 Once the tour that took less than an hour was completed and we had safely docked we disembarked the craft and gathered on the quayside where two of The Geezers made their way across towards the Olympic Stadium across a footbridge whilst the remaining members of our party headed back to the Carpenters Road Bus Stop to catch the 339 bus to our Bow Base. Previous Post:A Good Time had by All!